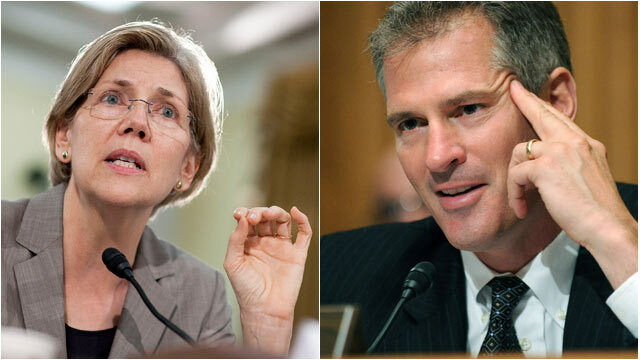 In the fight for the Massachusetts Senate seat, it's an epic battle between Republican incumbent Sen. Scott Brown against Elizabeth Warren, the liberal crusader famous for taking on Wall Street. The outcome of this race could decide the control of the United States Senate. ABC News recently sat down with both candidates while out on the campaign trail in the fever pitch leading up to Election Day. No Senate race in the country has been more expensive and more personal. Brown is a moderate who often defies his own party, but as Warren reminds voters every day, a vote for Brown is also a vote to put Republicans in charge. "People all around the country understand that this race may be for control of the United States Senate," Warren told ABC News in an interview in Taunton, Mass. "It's really about standing up for working families and that is what this race is about at the national level and it's part of what this race is about on the Senate level," Warren said. Warren has shattered records for fundraising and nearly 60 percent of the donations to her campaign have come from out-of-state. It was something of a political miracle when he won Ted Kennedy's Senate seat two years ago, but now Scott Brown is finding out how hard it is for a Republican to win again in Massachusetts. Brown, who can only hold on to his Senate seat if a lot of Democrats vote for him, doesn't like to talk about that issue, saying it doesn't matter much to him which party wins the majority in the Senate come November. "For me it doesn't really matter who is in charge," he told ABC News in an interview in Worchester, Mass., adding that the real problem is the dwindling number of moderate Democrats and Republicans in the Senate. "I'm just sick of the gridlock. It makes me disgusted." Brown says if Republicans gain control of the Senate, Sen. Mitch McConnell, R-Ky., the current minority leader, will still have to "earn my vote." "I'm not going to be happy with the gridlock that we've had, so I'm going to wait and see, and see who emerges, see if anyone's going to challenge him, and then I'll figure it out," says Brown, who agrees that McConnell bears some of the blame for the constant obstruction. Warren enjoyed early support from Democrats thanks to a video of her speaking on fair taxation and debt. "There is nobody in this country who got rich on his own. Nobody," Warren says in the video, which appeared online late last year. "You built a factory out there, good for you. But I want to be clear, you moved your goods to market on the roads the rest of us paid for; you hired workers the rest of us paid to educate; you all were safe in your factory because of police forces and fire forces that the rest of us paid for." Warren stands by what she said in the video. Brown says that video has helped his campaign. "It's actually galvanized the small business owners and the people that are out there working hard and getting up in the middle of the night or early in the morning and providing services. Third-, fourth-, fifth- generation businesses, they're deeply offended and they're voting for me." Republicans need to pick up at least three Senate seats to win the majority on Election Day. They've got a good chance in Republican-leaning states North Dakota, Montana and Nebraska. And World Wrestling executive Linda McMahon even has a shot in Connecticut . But Massachusetts has remained a toss-up. Polls have been consistently neck and neck throughout the race, with Warren recently pulling a few points ahead. The latest poll shows Warren up 5 percentage points, 43% to 38%. Asked why in one of the most Democratic states in the entire country, with President Obama polling now with a 30-point lead in the latest polls, this is even a race in the first place, Warren demurred. "You know, I'm out there every single day working for every single vote," Warren replied. "That's what I should be doing and that is what I am doing." If Democrats can defeat Brown -- they probably keep the Senate. It may not matter to Scott Brown whether Republicans control the Senate but Elizabeth Warren is betting it will matter a whole lot to all those Democratic voters in Massachusetts.